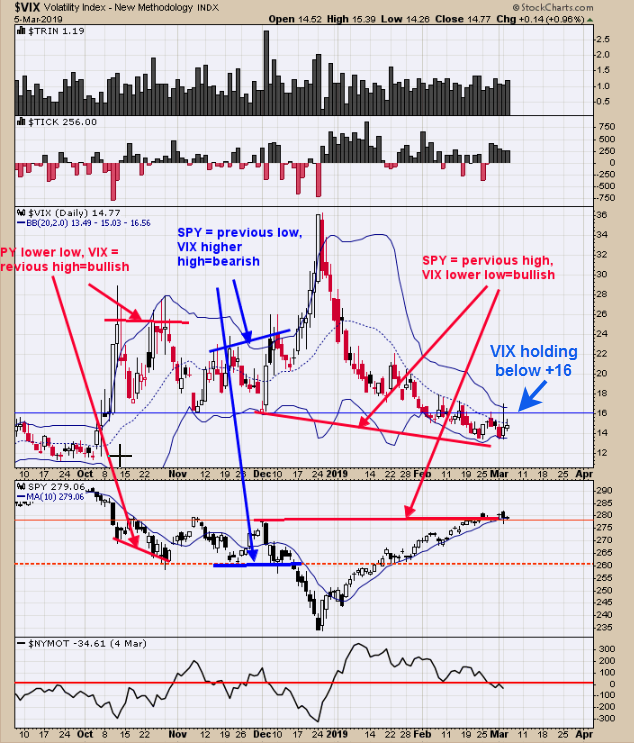 We have updated this chart from yesterday which is the VIX. SPY is in an uptrend when VIX is < +16 and in a downtrend when >+16; close today was +14.77.SPY is running into resistance near the 280 level which is the November and December 2018 highs but is not backing away from those highs suggesting the market may “eat” through this resistance. Next Week is Option Expiration week which normally has a bullish bias and the week before (this week) can produce short term whipsaws. The VIX trades opposite of SPY. The VIX has made lower lows below the November and December highs suggesting at some point the SPY will break above the November, December highs (280 SPY range). Seasonality shows market could be still until Tuesday or Wednesday of next week after which it turns bullish into month end. A bullish setup could be triggered in the coming days. SPX is running into resistance at the November December highs near the 2800 level. The 2800 SPX level is not produce negative ticks readings (which would be a bearish sign) but staying positive. The 100 hourly moving average remains above “0” closing at +47.56 (top window). The 30 hourly tick (bottom window) remains above “0” closing at +64.34 and actually gained ground. 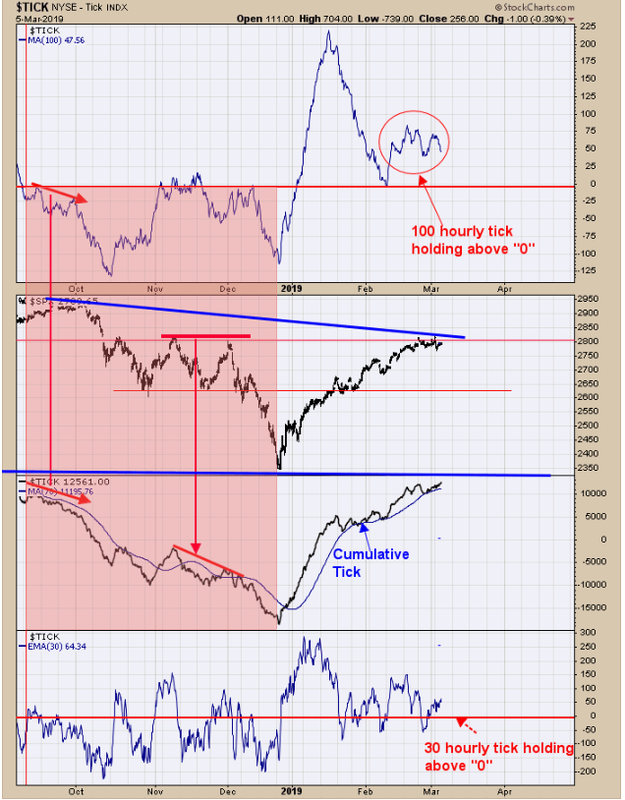 The next window up is the hourly cumulative tick which remains in an uptrend and bullish. So far these three different configurations of the tick show a bullish bias for the SPX. For a bullish setup, we would like to see a rising TRIN reading to add power to the next rally which could develop in the coming days. Not showing a clear signal here but tick and VIX readings are showing a bullish bias.